The word ‘transformation’ is quite loosely used in IT organizations or managed service providers. If you work for one or are have a related service or product you probably hear the word several times a day. For some, transformation is on the verge of becoming a corporate ‘buzz’ word – used and abused. It further confuses people when you talk about transformation instead of promoting a discussion. Though the usage sometimes can be vague, there is always one goal of transformation – radical and adaptive changes in business operations and IT infrastructures. Where should transformation start – Business operations or IT infrastructure? There have been many debates on which should come first. Do you make radical changes to your business operations, with IT transformation to follow, or vice versa? For enterprise transformation, both need to be upgraded parallel to each other. If you simply make changes to your procedures in business, your IT infrastructure will lag, slowing down the process. If you bring new technology into the business without any changes, then you will not be doing justice to the updated IT infrastructure. Enterprise transformation can and will happen only when both the sides are in sync with each other. Like all things, this will take time. Start with small steps. E.g. If a business wants to have a customized application they will need people in the business to be trained to use the application and a technical dept to develop the application. What is required to bring about transformation? Bringing about changes to the whole enterprise requires a team with strong skill sets in varied fields. Usually, the ‘star’ team members – people who’ve proved to be beneficial for the company – are chosen for this task. Transformation touches every corner of the enterprise. It brings about changes the way an enterprise runs, and no department or employee is spared. It requires people with experience and specialized skills. Often the project to transform is doomed before it begins, because the most important human resources have taken their eye off the ball. The regular business suffers because people are distracted. Transformation is not an option. In order to survive, businesses need to reinvent and keep growing to beat the competition. It’s survival of the fittest. Getting your ‘best’ team members to work on transformation is risky. Taking them away from Business-As-Usual can hamper the enterprise itself. Enterprises might have great talent working for them, but the chances that they are specialized in the IT industry are slim. The only choice an enterprise has is to manage transformation effectively. The way in which the transformation sweeps the organization is totally up to them. For a business to transform their IT infrastructure successfully they will require a third party to help them, i.e a managed service provider. 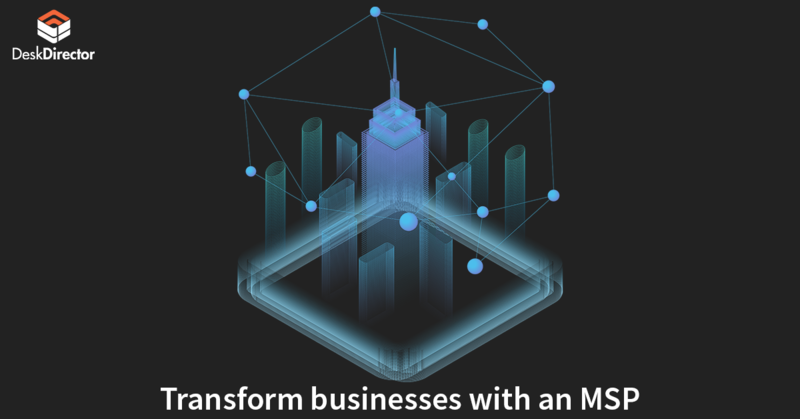 What role does an MSP play in transformation? Managed Service Providers of IT services and solutions are the third piece of the puzzle for enterprise transformation. The smartest option for an organization is not to use their internal team for IT transformation, but instead hire skilled experts for the job. An effective MSP will have a higher chances of creating effective transformation throughout the business. MSPs have the skill set and capabilities to manage legacy equipment, refresh the environment, upgrade or replace technology infrastructure, and provide ongoing operations to troubleshoot problems and optimize the IT environment. As an MSP, you can leverage your expertise and resources to help the enterprise transform their IT infrastructure. However, transformation is not isolated to IT infrastructure. To make radical changes, you need to create waves all throughout the organization – including key business processes. The old offerings by MSPs are not relevant any more. MSPs need to revamp their offerings from simply providing technical assistance to a more holistic offering. Your services cannot be limited to device monitoring, solutions support or incident resolution. This no longer adds value to the transformation of the enterprise. Your job is not to manage their environment but help them achieve the transformational goal. This means you need to work with their team to provide transformational outcomes and comprehensive solutions that positively affect core business and IT operations. What do transformational managed services look like? The focus can’t be only on Day 2 – operations of devices and solution after deployment into production environments. The aim is to get outcomes with holistic solutions. This can happen if you engage with the teams within the firm. Communicate and collaborate across team to give results from Day 0 to Day 2. Treat yourself like an extension of their team, not a third-party service provider. Companies serious about transformation are not looking to ‘shop’ for MSPs. They need a good fit for their firm. Does price matter? Of course, but that will not be their only priority. They are not looking at your services like a commodity, they look at as you a force of nature. You are adding value to their business. Enterprises focused on pricing are not yet ready for transformation. Operating expenditure reduction is a part of your last-generation value proposition. It is still an important factor. And there can be significant change with the right provider. But that’s not the focus. Efficiency in core business level is key. Your value lies in helping them innovate, communicate, grow and collaborate. The transformational shift makes them more effective and efficient in the business. Managed service providers need to manage the transformational journeys for their customers, partnering visibility and control while the journey takes place. Not all providers have the resources or vision to provide transformation. Spoiler alert! We will be covering all these pillars and talk about the transformation journey you can take for your MSP. DeskDirector will be your 12th man on your team when you take this journey - innovating the way you do business. Before you transform other businesses, transform yours so that you are seen as an example in the industry. Be the industry leader, not a follower. This article was originally written by Cisco. You can read it here.